Posted on Tuesday, December 24th, 2013 at 9:01 pm. 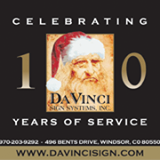 DaVinci Sign Systems, a national design and build sign firm headquartered in Northern Colorado, is celebrating its tenth year in business next month. General Manager, John Shaw decided to shift gears 10 years ago from building custom homes in Fort Collins and focus his knowledge of the construction industry on designing and building custom signage for businesses and organizations. “I love the industry,” said Shaw. “We make custom products, using quality workmanship and design to create a monument to an organization.” DaVinci specializes in custom fabricated digital LED message centers; electric, architectural, and masonry displays; and other specialty identity signage. You will see their work along Interstate 25 and throughout the local communities along the Front Range. But monument sign design, creation, and installation isn’t an easy industry to be in. According to Shaw, since he has been in business, many sign companies in Colorado have closed their doors, filed bankruptcy, or have left the market due to fierce competition and the difficulty of the industry. Regulations, including building codes, sign codes, UL and OSHA rules, and crane and lifting requirements have made building and installing signs much more difficult than it has been in the past. “It’s relatively easy to manufacture our products, but there are an awful lot of people telling us how we have to do it,” said Shaw. Shaw chose to name his company after Leonardo DaVinci, the artist, inventor, and innovator who Shaw said was way ahead of his time. “We strive to follow his lead,” said Shaw, who likes to use old technology such as stone carving, combined with new, like LED electronic message centers, computer-aided manufacturing and design, and 3D modeling in his sign projects. The location of DaVinci is near I-25 and Crossroads Blvd., a geographically central location in Northern Colorado with easy access to customers in Denver. The company is in need of a larger production facility, but intends to stay in Northern Colorado. For more information on DaVinci Sign Systems, visit www.DaVinciSign.com.